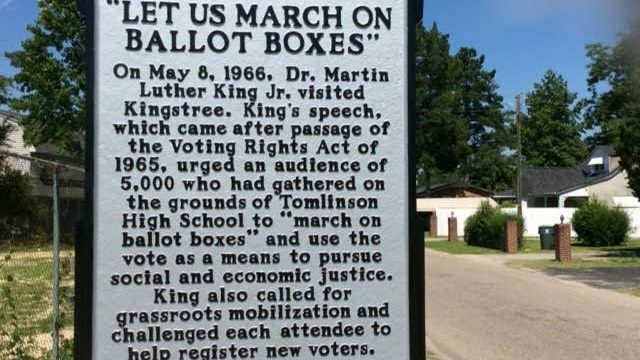 On May 8, 1966, Dr. Martin Luther King Jr. visited Kingstree, where he urged an audience of 5,000 who had gathered on the grounds of Tomlinson High School to “march on ballot boxes” and use the vote as a means to pursue social and economic justice. King also called for grassroots mobilization and challenged each attendee to help register new voters. 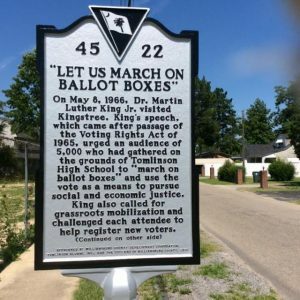 King referred to the moment as a “second Reconstruction” and reminded the audience that during the first Reconstruction S.C. had elected African American representatives to serve in the State House and U.S. Congress, and could do it again.